Louisiana State Police located a vehicle they suspect was involved in a recent hit-and-run collision on Interstate 10 East. An article about this ongoing investigation is available here. According to police, investigators recovered a silver 2003 Mercury Grand Marquis. While no license plate number was available, damage to the vehicle matched what investigators expected. Investigators say the vehicle sideswiped a truck, leading to a fiery crash which closed the road for several hours. The driver of the vehicle currently remains unidentified. As reported in an earlier story, a truck fire on January 9th closed the road for miles. The crash occurred near the Veterans Memorial Boulevard exit when the Grand Marquis sideswiped a truck pulling two trailers in tandem. When the driver of the truck lost control, one of the trailers tumbled from the elevated highway and caught fire. The driver of the Grand Marquis continued eastbound on Interstate 10, police say. The truck driver was taken to a local hospital with minor injuries. In Louisiana, 84 large trucks were involved in fatal collisions during 2014. 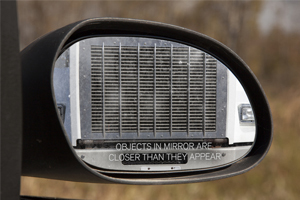 That year, approximately 438,000 large trucks were involved in traffic accidents on U.S. roads. Those accidents injured a total of 111,000 people, killing 3,903 more. If you or a loved one has been injured in an accident involving a tractor-trailer, call the experienced Louisiana Tractor Trailer Accident Attorneys at Gauthier Amedee at 225-647-1700. You can also submit a free case evaluation form on our website. When you call, you will speak with a leading Louisiana Tractor Trailer Accident lawyer for FREE.